Ever since the Scandinavia Section was built in 2004 there is a real water basin in our exhibition holding 30,000 liters of water. This article is all about the goal of computer operated ship traffic. Upon completion, the ship control mechanism doubtless will be one of the Seven Wonders of the Wunderland World. So far, the biggest technical challenge for the Miniatur Wunderland is the development of the ship control mechanism. It was, and is, the ultimate goal to develop a system which will navigate several ships simultaneously through the Wunderland Oceans. Alongside the current routes it could also allow for a ferry service navigating the smaller piers as well. Even before the project started in 2004, all experts were sure that this task was basically impossible. And they weren't half wrong, because more than once did chief developer Gerrit Braun and his team believe they had made a breakthrough through the years, only to face new obstacles. But of course the Wunderland team will not be defeated and therefore the “problem child” ship control has undergone steady development over the years. And how does this look? Read for yourselves! A freighter entered the full functioning lock. In the background, you can see a small part of the moveable lift bridge with its four rail tracks. So far 16 high speed infrared cameras have been mounted to the ceiling of the Scandinavia section in order to track the ships. Twelve cameras are overlooking the large water expanse from the drilling platform and the Captain’s workspace to the car boarding close to the “Cap San Diego”. Four more cameras are located in the lower fiddle shipyard. Each of these cameras records 60 frames per second and is equipped with a special filter, which largely fades out any disturbances such as the ceiling light and its reflection on the water. The ships are individually equipped with 4 infrared LEDs. Each ship has its unique signature for the software system. A centrally located transmitter sends out impulses every microsecond which are in return answered by the individually addressed LEDs. Basically the software calls a certain ship and the ships LEDs answer, all in the course of micro seconds. This secures that only one ship lights up at a time. That way the distinction of the ships is easier and their current direction can be determined. In order to track the ships it is important to calibrate the software system. In this process the software learns the location of the cameras and builds its own data base to later define distance and angle of the ships. This calibration is performed with a precisely measured calibration rod. It is moved across the entire water surface and presented to the cameras in as many different perspectives as possible. Since the software is familiar with the calibration rods exact measurements it can determine distance and angles that way. It takes about two hours to calibrate. The calculating system within the software is dependent on the fixed positions of the cameras – these may vary due to the way our building moves with the changing of seasons and temperatures. Currently we estimate that the system will have to be calibrated every six to nine months. The locations calculated by the software are assimilated and put into context by the vehicle control system written by Gerrit. The software then can plot routes or recognize possible collision. Wunderland’s Scandinavian countries share the extensive harbor facilities. At this dock, general cargo and containers are handled. Currently (end of February 2018) we have reached a state of stable location tracking over the entire water surface – including the fiddle ship yard. “Jenna”, our test ship, is equipped with four LEDs; the same applies to the cruise ship “AIDA” and the giant container ship “Pacific”. Bit by bit the rest of the fleet will be converted, meaning the LEDs will be attached to the ships. We have to consider each ships unique condition in the refurbishing process. The LEDs should be “invisible” to the visitors, but in full view of the cameras and not accidentally obscured by the super structural parts of a ship. Since we combine this refurbishing process with a ships regular service schedule, when it is at the workshop anyway, we cannot yet say when we will have completed the entire fleet. There is a steady connection between the computer and the ships. This was an important step in order to replace the current radio control. The ships can now be operated via a gaming controller attached to the computer. It still needs a person to operate the controller, the communication though runs entirely through the ship control system, where we will continue work and complete the algorithms for navigating the ships. Now that we have built a stable infrastructure, we are undergoing the phase of realizing a control self-governed by the software. Gerrit has already done a lot of profound research and development in this area, but the software status needs to be adjusted to the current settings. The first software version will probably only enable navigating longer distances on open waters, leaving the delicate process of mooring to the Captain. We will hopefully have our waters under control soon, and then be able to expand the system to the channel and the sewer port all the way to the second fiddle ship yard. 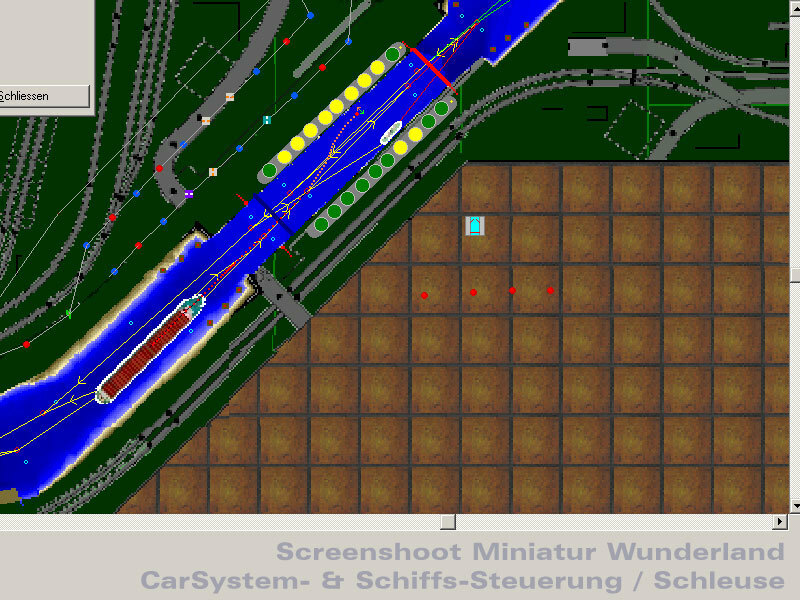 Last, but not least, here is a screenshot of the ship control in the area of the sewer port (left). You can see the calculated route of the ship (red dotted line) on the pre-configured route (yellow arrows). Inside the sewer port the positions are visible (yellow = occupied, green= vacant). Red virtual buoys are used as anchors along the sections of the route. Blue virtual buoys mark possible lay-bys in the occurrence of oncoming traffic.